Summary (from the Publisher): Would you risk your life--or your soul--for the sake of art? Originally from Hawaii, Waimea Williams spent a decade in Austria and Germany as an opera singer and has received fiction awards from Glimmer Train, The Lorian Hemingway Competition, and Salamander Review. She has enjoyed the honor of a writing residency at the Ragdale Foundation, and her short story “Vienna Quartet With Dog” received First Prize from the Charlton Review in 2012. She currently lives near Honolulu. What a GREAT book!! I am so excited that I got the opportunity to read this. As a lot of you know, I am a Music Education major. I am constantly surrounded be Classical, Baroque, and Romantic music. My primary is also vocal, so I also sing this music as well (Fun fact: this year I will be singing "L'amero, saro constante" by Mozart himself). I believe it is safe to say that I felt a special connection with this book, and probably understood it a little more than most. It makes me so happy when people speak my language! This was a wonderful literary work that mixed history, art, culture, and education. This is a deeper story than a lot of people are used to, but I assure you that you will be taken on an adventure nonetheless. I loved the main character, Maile. I found myself connecting with her in so many ways. 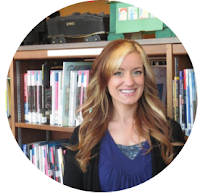 In the beginning of the book, she is first exposed to the work of Verdi, and while the rest of her class takes it at face value, in a way it speaks to her, and this sets the stage for the rest of her life. I took a break from music for about 3 years while I tried to figure out what to do with my life, but it always found its way to me even when I wasn't looking. I can now say, "nothing moves me more than music," and that's how I know that my soul is missing a huge part of itself without it. I've never been faced with life-threatening decisions like Maile was, but I can understand her love of music through it all. 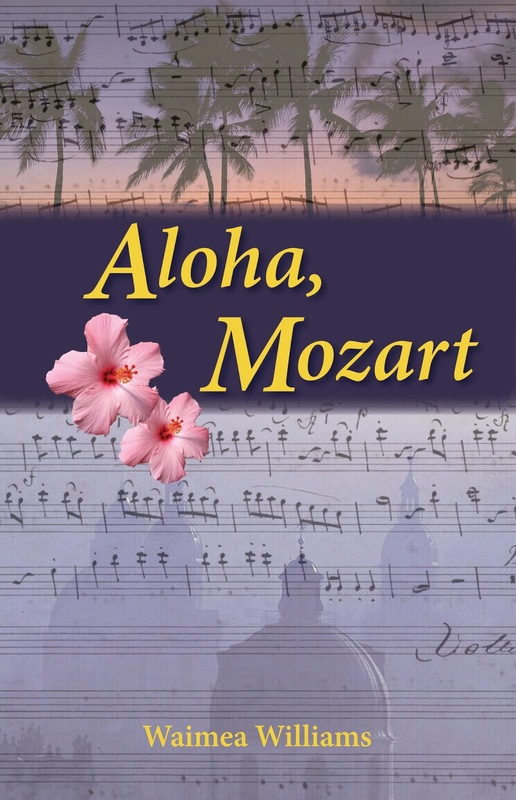 Even if you aren't a music person, you can still enjoy Aloha, Mozart. If you are into literary/historical fiction, you will enjoy this. For the most part, it was written beautifully. However, the only thing I would complain about is that some parts didn't seem entirely organized very well. It just caused me to reread through some parts to make sure I understood what was happening. Other than that, I loved this book and will definitely read it again. That's it! One random commenter during this tour will win a $25 gift card. Visit more blogs for more chances to win--the full list of participating bloggers can be found here. The other $25 gift card and the 3 autographed books will be given out via Rafflecopter. You can find the contest entry form linked below or on the official Luminis Duo tour page via Novel Publicity. Good luck! 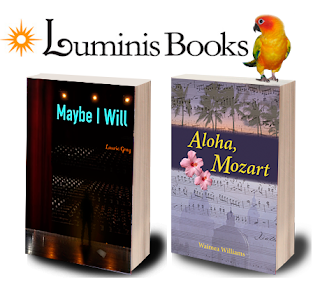 Luminis Books was launched in January, 2010 by husband and wife team Tracy Richardson and Chris Katsaropoulos with a mission to publish thought-provoking literary fiction for children and adults. We publish what we love: Meaningful Books That Entertain. Our award-winning books engage and inform readers and explore a wide range of topics from love and relationships, teen sexual assault and homelessness to string theory, consciousness, and the Universal Energy Field. Luminis Books is a proudly independent publisher located in Carmel, IN. Learn more at www.luminisbooks.com. 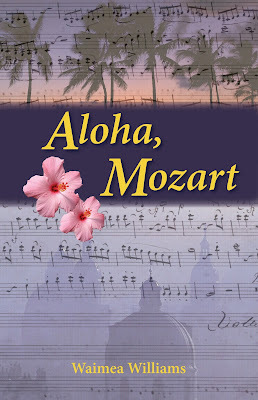 Learn more about Aloha, Mozart's tour mate HERE. Thank you for joining us on this tour and for cross-posting your awesome review to both Amazon and GoodReads when you get the chance. Don't forget to enter the Rafflecopter and random commenter contests as well. Thank you so much for such an enthusiastic review. I'm delighted it connected so thoroughly with you and your own musical track in life. All the very best for your performance of Mozart. He does not disappoint.